Savvy Spending: College Students: Get a Free 6 month Trial of Amazon Prime, plus 50% off the Membership after that! 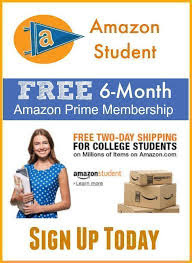 College Students: Get a Free 6 month Trial of Amazon Prime, plus 50% off the Membership after that! College Students- Here is a great offer you should be taking advantage of! Join Amazon Prime Student and get FREE Two-Day Shipping for College Students ! Amazon offers their Prime membership program to college students at HALF Off, plus you get a FREE 6 month trial! If you're interested in checking it out, GO HERE!